I'm coming off of my Thanksgiving week high, settling down, and what's the first thing I think of when I get back to my desk to do some writing? Cruelty. Institutional cruelty, at that. Political cruelty. The kind of cruelty that knows no bounds and fears no punishment. A new kind of cruelty, right out in the open and expecting rewards. The New America, courtesy of the Tea Party, the Koch Brothers, Leviticus and Deuteronomy. I had a lovely week. Our dinner was great, I avoided Black Friday, we celebrated a good man's birthday, and our 350 mile trip back home was uneventful. No wind or snow or traffic jams, and the ferry, our lifeline, was running on time. Maybe it was because of that fine respite--I don't know--but at my desk those thoughts about where we are on the inhumanity front kept coming through. If there is a catalyst, I blame Joe Arpaio, the infamous, publicity-seeking sheriff of Arizona's Maricopa County. He's the guy who thinks it's cute to keep his prisoners in pink underwear. He stays awake nights trying to come up with ideas to humiliate and demoralize the inmates in his care. He gets a real kick out of it and never misses a chance to publicly tighten the screws. To save money, Arpaio says, he feeds his prisoners only twice a day on between 15 cents and 40 cents a meal. The meals are vegetarian, no salt and pepper. He's working on charging them a dollar a meal, because, he says, "Everybody else has to pay for their food, why should they get freebies?" 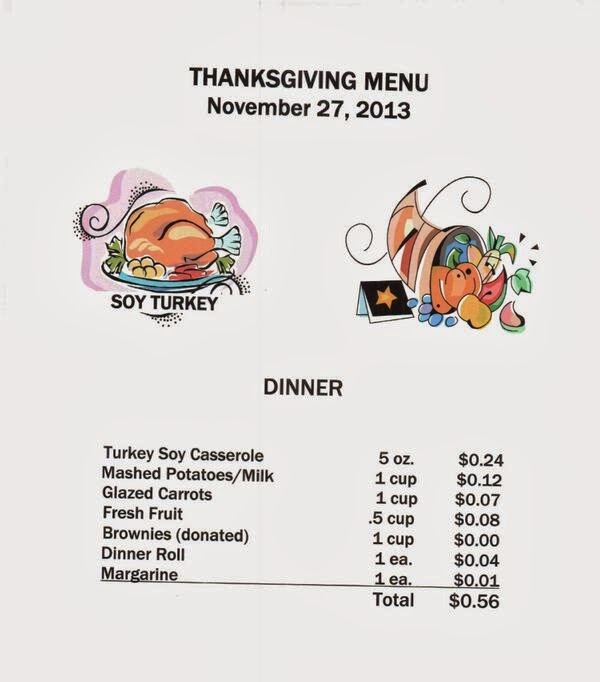 "Thanksgiving menu is all set! 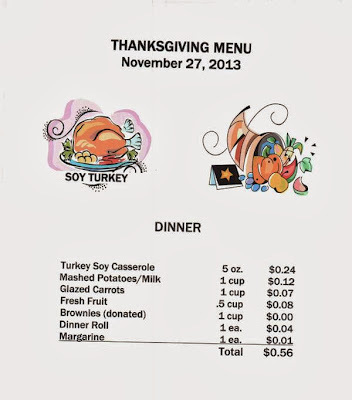 Hope the inmates give thanks for this special meal being served in the jails tomorrow." But Joe is small potatoes compared to the various Federal, state and local leaders busy thinking up ways to stick it to the little guy. Governors refusing Federally endorsed Medicaid for their citizens. A $40 billion cut in food stamps. A fight to block minimum wage hikes. Cuts in unemployment benefits. Cuts in Veteran's aid. Cuts in public education. Complete and total neglect of crumbling infrastructure. Refusal to recognize the Affordable Care Act, along with a hearty wish that that damned website would just die already. Cruel, cruel, cruel, cruel, cruel, cruel, cruel, and cruel. Every "no" vote, every obstruction sentences hundreds of thousands to needless suffering. But because that kind of cruelty is now the American version of politics-as-usual, some of us rail (and not for the first time) while some of us cheer, but in the end, the power is no longer with the people. Endless, needless, avoidable suffering and nobody goes to jail. Except Joe Arpaio, but only long enough to torment his inmates for yet another day. Then he gets to go home, where nothing can hurt him. Ever. And there are plenty of people who would applaud this. Is there really no one who gives any thought to why we have the highest incarceration rate in the world in the first place? You're right, Katy. Whenever the subject of Arpiao comes up--or any of the other punishments for the poor and disadvantaged--the creeps come out of the woodwork to rant about criminals and/or the lazy parasites. What they seem to forget is that not anyone in jail is bad. Just as not everybody in church is good. It's just not that simple. As I live in the State of AZ, I can attest to that. When I saw the menu, I was appalled and he and his minions thought it was their reward for their crimes. And I am beyond stunned at the level and playing field of the people that are literally going hungry and those numbers will multiply next year as the Congress blocks/cuts even more social net programs. Raising the Minimum Wage throughout this country would help but let's face it: $10.00 an hour is too much for people living on the edge of poverty and one would want to obstruct this. Our Veteran's have been fighting wars in the Middle East for over 10 years now and there are inadequate, over-worked and burdened Veteran's hospitals and outpatient services that are desperately needed. Waiting time is over a month and could be longer and yet when these brave men/women were deployed, there was no delay in serving their country. Infrastructure repairs need to be done. There are bridges falling and in need of repair and roads that need to be re-done. The last infrastructure that was done goes back to President Eisenhower when he set up the road systems throughout the United States and the bridges. This was done in the 1940s. The number of people and the number of children trying to survive on bare minimum Food Stamps (SNAP) covers basics and as is seen by some Congressional leaders, it's not enough to last the month. And this program does not allow one to buy personal care items, laundry detergents and cleaning supplies and vitamins. And the GOP Hate Machine calls these people, slackers or lazy or just content to be on the Government Dole. And the Washington Leadership led by John Boehner are so removed from the day-to-day reality of these people and they have the power to withhold monies and most of them are millionaires. You're so right, Nedra. We have to start recognizing that so much of this "penny-saving" is nothing more than blatant cruelty. The poor and disadvantages have it hard enough without having to be punished for them circumstances. And Arpaio is a maniac who has no business keeping the kind of power he holds. He should have been fired or thrown out of office long ago. Instead, he gets re-elected. Insanity. Arpaio is the kind of asshat that makes Simon Legree look mediocre in his psychopathy. Glad your trip was safe and your gathering was fun. You've got a great blog and for that I give thanks! The problem with a man like Sheriff Arpaio is the Ghost of Christmas Past won't find any regrets. The Ghost of Christmas won't find any shame. The Ghost of Christmas Future couldn't find any fears. Well put, Gardner. Thank you!